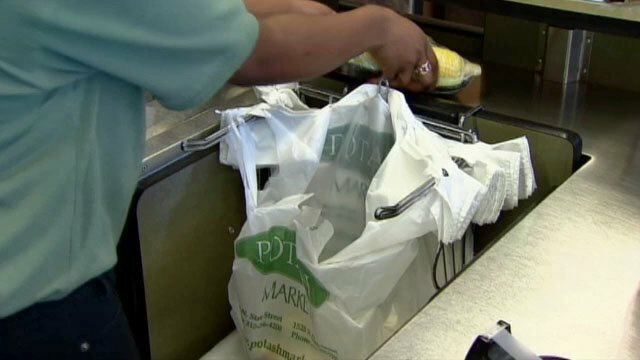 Watch the video: The city of Chicago's partial ban on plastic bags goes into effect August 1. Its restrictions affect major retailers immediately, though smaller stores are exempted from the rules for the first year–and restaurants get a pass entirely. But the ordinance as it's currently written will still allow stores to give out plastic bags, provided that they're tough enough to hold up for 125 uses. Ald. George Cardenas (12th Ward) wants to close that loophole by banning stores from giving out all plastic bags, and by imposing a fee on paper bags. Ald. Cardenas joins Chicago Tonight to talk about the current ordinance and his proposed change, along with Jordan Parker from Bring Your Bag Chicago and Tanya Triche from the Illinois Retail Merchants Association. Starting August 1, the city of Chicago will be among more than 100 counties and municipalities across the nation that have enacted legislation to discourage or prohibit the distribution of single-use plastic bags. Not all bag-ban laws are the same, however. Some cities charge customers a small fee to use plastic bags and offer nominal discounts as an incentive for bringing reusable bags. Others have imposed taxes on the bags or banned their use completely. Jordan Parker, founder of the grassroots environmental movement Bring Your Bag Chicago, weighs in on these types of ordinances and how Chicago's new law stacks up, below. But first, here’s what you need to know before heading to the store next month. What stores will be affected by the plastic bag ban? First and foremost, the ban affects chain stores, which the city has defined as three or more stores under common ownership or any store that’s part of a franchise. The ban beginning August 1 will apply to stores with a floor area greater than 10,000 square feet. The rules will be extended to stores with a floor area of 10,000 square feet or fewer on Aug. 1, 2016. The ordinance does not apply to any stores that are not considered a “chain store” or any dine-in or take-out restaurants. Does this mean some stores will no longer provide bags? No. Unless the store didn’t previously provide bags (Costco, for example), stores will still have bags for its customers to use; the bags will just be a little different. If stores still plan to provide bags for customers, they must be reusable bags, recyclable paper bags, or commercially compostable plastic bags. Will I be charged for using their bags? Maybe, maybe not. That’s up to retailers. Some may sell the bags for a small fee (a practice already in place at Aldi) but others may choose to distribute them for free. Customers are allowed to bring whatever kind of bags or boxes they want into the store for their own use. So whether you’ve got reusable cloth bags or a stash of plastic ones at home, you can bring them with you to carry your things. Some stores — including Target, Whole Foods, and Trader Joe’s — already give customers small discounts for bringing their own bags and have said they plan to continue doing so after the ban is in place. Yikes. I always forget to bring my own! Fear not: Many stores plan to take advantage of what seems like a loophole to the law by offering thicker, more durable plastic bags that are still permitted under the city’s specifications. But doesn’t this law ban plastic bags? How is that allowed? The ordinance provides specifications for what constitutes a “reusable bag": The bag must have handles and be specifically designed and built to be used and reused multiple times. Lawmakers have gone so far as to mandate a minimum lifetime of 125 uses, which they’ve defined as the ability to carry at least 22 pounds over a distance of at least 175 feet 125 times. Paper bags are not completely green either. It takes a lot of (and often more) energy and water to produce a paper bag rather than plastic, in addition to emiting higher amounts of air pollution. The process to recycle paper uses more fuel than it would take to actually make a new bag. The EPA has also found that paper and plastic take about the same amount of time to degrade in a landfill. How will the rules be enforced? What happens if a retailer fails to comply? Citizens are asked to report violations by calling 311 and providing the name and address of the store. City inspectors are going to focus on the visible requirements, such as whether a bag has handles and contains the required printed information on it. The city may periodically audit retailers by sending bags to a lab for more in-depth analysis of the bag’s composition. Depending on which section of the ordinance they violate, offenders are subject to a fine between $100 and $500. Despite the partial ban on plastic bags going into effect in Chicago on August 1, an environmental victory is not yet in the bag. The first piece of plastic bag legislation in the U.S. was passed in San Francisco in 2007, and it banned plastic bags from large supermarkets and pharmacies. Jordan Parker, founder of grassroots organization Bring Your Bag Chicago, explained that the law represents a “first generation" ordinance, meaning that it was an original ordinance with some loopholes that could be exploited and, therefore, need to be closed. Parker said that the ordinance slated to take effect in Chicago on August 1 falls under the same category. But Parker says the problem isn’t so much with what the bags are made of. Parker said the larger issue here is consumers’ notion of a “free” bag. What’s perhaps more troublesome is that the thicker, reusable plastic bags that stores plan to distribute are more harmful to the environment, and more expensive for consumers. Despite being manufactured for reuse, Parker doubts that shoppers will bring the bags back to the store for reuse as long as they believe the bags are free. “It’s a lose-lose right now,” Parker said. To remedy the situation, Parker would like to see City Council amend the ordinance to close the loopholes in the law, making it a “second generation” ordinance. “Chicago would be on the map as a progressive city with an effective bag ordinance that makes sense,” she said. Parker cited a law adopted in 2009 in Washington, D.C. as a strong example of a "second generation" ordinance. In the nation's capital, consumers are charged five cents per single-use plastic bag. Some of the money collected has since been used to clean up the Anacostia River. “That fee triggers awareness in the consumer that this is a waste problem and they should start reusing their bags,” Parker said. Of course, some of the plastic bags shoppers collect from stores do find a second use: lining garbage cans or collecting dog waste. But Chicagoans aren’t lining their garbage cans at the same rate that they’re collecting these bags — which Parker calculated to be 2,568 bags per minute — and those bags then find their way to landfills, where they sit for years and years with pet waste or garbage entombed inside. Parker, a dog owner herself, suggests tearing off small pieces of plastic film from other products and using that for clean-up duty. She also encourages composting organic waste when possible. Unfortunately, many plastic bags don’t find their way to the recycling bin, and those that do don’t find much further use. They either get caught in the machinery that’s used to recycle them or turned into plastic pellets that lack a market of buyers, according to Parker. Paper bags, which have their own environmental issues, are not necessarily better, she says. “Both types of bags have pros and cons and the bottom line is any type of single-use disposable bag that you at best reuse a few times and then get rid of is not sustainable for the environment,” Parker said. For now, Chicagoans will probably see both options available as stores attempt to comply with the ordinance. “There’s going to be a lot of confusion initially because it’s a patchwork of different stores that are affected and how those stores are reacting to this ordinance,” Parker said. Still, Parker is hopeful and confident that the City Council will recognize the concerns brought up by Bring Your Bag Chicago and amend the law. “We just want legislation on the books that is good for consumers and good for the environment,” she said.